New Delhi, Jan 14: A historic India central Asia Dialogue will impart a dynamic orientation to India's traditional links with Central Asia region. External Affairs Minister Sushma Swaraj is back home after her 1st India-Central Asia Dialogue in #Samarkand. Next Dialogue to be hosted by India in 2020. 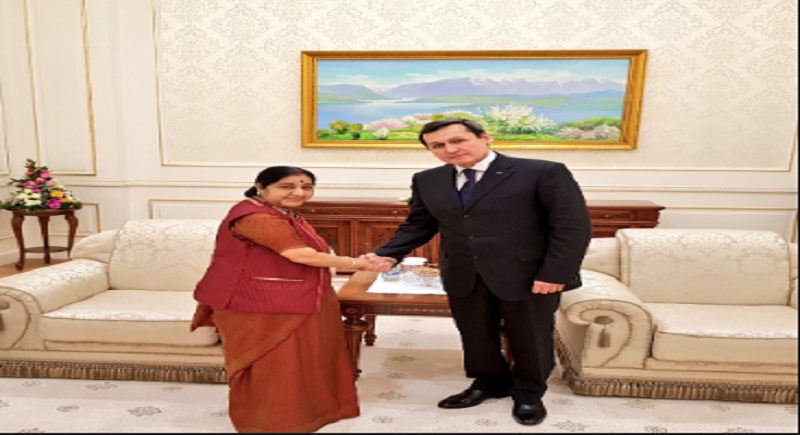 “EAM @SushmaSwaraj met the Foreign Minister of Turkmenistan Rasit Meredow on the sidelines of the India-Central Asia Dialogue in #Samarkand. Discussed enhancing bilateral cooperation across sectors.” Tweeted Raveesh Kumar, External Affairs Spokesperson. “I have great pleasure in welcoming my colleague and Foreign Minister of Afghanistan H.E. Mr Salahuddin Rabbani, who has kindly accepted our invitation to participate in this very historic First India-Central Asia Dialogue. Both India and the countries of Central Asia have had sustained and enriching contacts with Afghanistan over centuries. 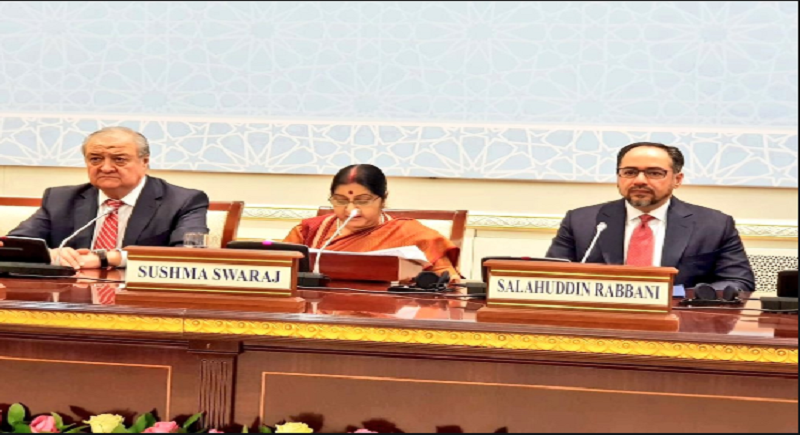 Goods and people have travelled freely over centuries back and forth between India and Central Asia through Afghanistan.” Said Sushma Swaraj in her statement. We have shared an interest in enduring peace, stability and security in Afghanistan. 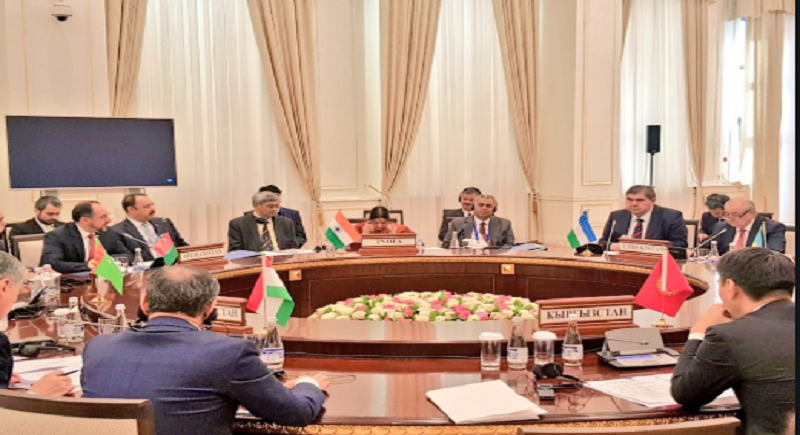 India is extending development assistance to Afghanistan of over US$ 3 billion, focused on reconstruction, infrastructure development, capacity building, human resources development and connectivity. Under the ‘New Development Partnership’ launched in September 2017, new projects are being taken up. 2. low-cost housing in Nangarhar province. 3. 116 High Impact Community Development Projects and (iv) a host of other infrastructural development projects. Over 3500 Afghan nationals are trained and receive education in India every year. While geographically Afghanistan and Central Asia are landlocked, there are several ways in which India, Afghanistan and the Central Asian countries can join hands to work on promoting connectivity in the region so that trade and commerce may flow between us and our people to people exchanges may prosper. We have already sent a very substantial quantity of wheat to Afghanistan using the Chabahar port. Last month, the Indian company opened its office and took over operations at the Shaheed Behesti port at Chabahar. We are looking at developing the Chabahar-Zahedan railway link which would bring us closer to the Zaranj-Delaram road link which India has already built in Afghanistan. At this forum, I have the pleasure to inform you that Iran is holding the Chabahar Day International Conference on 26 February at the Chabahar port to introduce to the invited delegations the capacities of the port.